Your business trip went exceedingly well. You accomplished everything you set out to do, made some great new contacts and now you are ready to head to the airport to catch an 8:30 p.m. flight home. Then, without warning, it happens – flight delay! Instead of rolling into the driveway around 11 p.m. you end up watching the sunrise on your street some seven hours later. 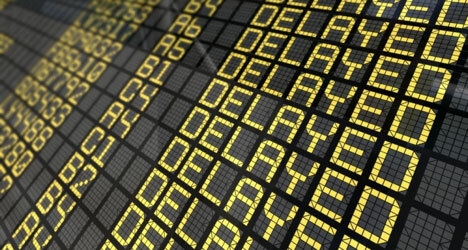 The very words “flight delay” immediately conjure up a sense of anger, frustration and even doom for any business traveler, family vacation or any trip for any traveler. Unfortunately, flight delays are such a common occurrence they have been nearly impossible to predict or manage. They happen for a variety of reasons: bad weather, mechanical issues, airline computer malfunctions, security breaches and the recent sudden grounding of Boeing’s 737 planes. Back in the days when pay phones were the only communication option available to travelers to check on the status of a flight, travelers often didn’t find out if their flight was delayed until they arrived at the airport. Remember the classic movie, “Planes, Trains and Automobiles,” starring Steve Martin and John Candy. This is exactly what Martin’s character Neil Page experiences. After making a frantic dash to the airport, he learns of the flight delay. To add even more insult to injury, he ends up meeting Candy’s character, Del Griffith, the shower curtain ring salesman who proceeds to drive him insane. If only there was a way back in 1987 that Neil Page could have checked his flight ahead of time so they could at least know the flight’s status before heading to the airport. Fast forward to 2019 and such a solution exists. Thanks to the ever-changing world of smartphone apps, now you can have the ultimate tool to guide you through the morass of flight delays. The FlightAware web site and app that includes the Misery Map allow you to check on the status of any flight so you can see firsthand if it is delayed. With this tool at your fingertips, you can easily find out if you can sleep for another hour or so. You could also spend a few hours enjoying a fine meal at a downtown restaurant instead of having to spend too much time waiting out the flight delay inside the terminal. Travelers can review current flight delay information which shows how many flights are delayed or canceled for the current day. You can click the status of any single airline. It is true that we will probably never see an app that can eliminate flight delays, but at least we don’t have to be completely ruled by them.